This page includes labels with sketchbook ideas that can be cut out. Sketchbook Cover: Create cover on your sketchbook based on your identity. Media: Cut paper, collage, drawing, painting, words, etc. Draw a Pile of Shoes: Zoom in. Fill up the page. Extend the composition to all four sides of the paper. Do it in pencil, ink, Charcoal or other media. Can be line, tone, contour, crosshatching, etc. Reflective Surface Study: Combine various reflective surfaces. Draw it. Texture Study: Close-up study of a leaf, tree bark, or organic texture. Any medium—cut paper, collage, ink, pencil, watercolor, colored pencil, mixed media. Drapery Study: Must be carefully observed and drawn with 3-dimensional volumes, tonal changes, highlights and shadows. Cemetery at Night: Draw a cemetery at night. Use dramatic lighting. You may want to begin with black paper pasted into your sketchbook. Media: inks, colored pencils, Charcoal, pastel, Cray Pas, etc. Jungle Drawing or Design: Draw/design a view of the jungle. The view can be from below (as if you’re an insect), or from above (as if you’re a bird). Any media. Mixed Media Collage: Choose a newspaper story important to you. Cut it out, use it as a background to past collage images on top. Draw/paint additional images. Include words. Change the scale of things. Integrate large and small shapes. Change of Style: Divide the page into 4 equal sections. Draw an object/objects in one section. Repeat the same drawing in the other sections, but change the style of each (representational, abstract, cubist, ink stipple, harmonious, complementary colors. A Pile of Shoes: Draw a pile of shoes. Your Feet in a Prone Position: Lie on your bed and draw your feet and what is behind it in a prone position. Make sure you "compose" the picture. Use all four sides of the page. Your Sunglasses: Zoomed in at an interesting angle and what they reflect. Distortion: Choose an object, person or another thing and distort it, repeat it, enlarge it. Your choice of media. Juxtaposition: Combine unlikely images. Exchange, overlap, or superimpose parts to create unusual relationships and a new synthesis. Use color, mixed media. Abstraction: Create an abstraction looking at Paul Klee, Miro, and Kandinsky. Create three versions of the composition in different color schemes. Use color. Negative Space: Look at an area in your home and draw the negative shapes around the objects. 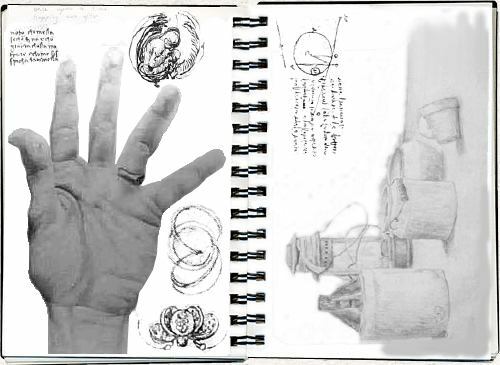 On another page in your sketchbook, copy the composition and do something different with it in tone, color or line. Dynamic Brushstrokes: Create something using dynamic brushstrokes, contrast and varied lines. Use color. Photocopied Collage of Face & Body Parts: Photocopy faces and body parts and create a design with actual drawings you made of these parts. Blur parts of the design. Overlap images. Layer. Advertisement of Yourself: What would you like to say about yourself? Use mixed media to create an advertisement of yourself. View of Yourself or Others in a Car Mirror: Any media. Magnifying Glass: Draw a view through a magnifying glass. Include the magnifying glass. Any media. Close-up Study of a Flower: Look at the artist Georgia O’Keefe. Media: colored pencils, watercolor, inks, pencil, sharpie pens—any or all. Collage—A Family Portrait: A grouping of photos of you and your family with words, drawn images, mixed media. Express what you think your family is about. Detail of a Portrait Photo Blown Up: Cut out a square (1 ½" x 1 ½") from a portrait photo and blow it up to the largest square you can make in your sketchbook—10" x 10". Fragment an Object, Person or Thing: Split, fragment, invert, rotate, shatter, superimpose, and/or divide an image and then reconstruct it to create a new synthesis of parts. Distorted Interior: Look at a room. Distort it. Create something new from it.